It’s sometimes depressing to be right. Having watched Goodbye Gemini I experienced that very seemingly contradictory sensation as I looked the film up (a habit I have long got used to) in Halliwell’s Film Guide. True, Leslie Halliwell himself could not have seen all the films within the bulging pages of the book that bears his name (he did, after all, go to that great picture house in the sky in 1989), but sometimes the reviews within are very, how shall we say, ‘Halliwell-esque’. A case in point is that of Goodbye Gemini, a film he describes as an ‘abysmally over-the-top melodrama with a swinging London backdrop’, following this up with ‘its immaculate appearance only makes it worse’. As will be evident from my opening comments, I had predicted this reaction- though purely from my experience of Halliwell as notoriously ‘un-hip’ rather than from any evidence inherent in the film itself. In fact, the film itself generated the very opposite reaction in me- it is certainly no undiscovered masterpiece, but it is very much a cult classic, its strengths for me far outweighing the weaknesses which Mr. Halliwell, with his usual disregard of ‘swinging’ films of this type, perceived. Despite my assertion that Leslie Halliwell was unduly curmudgeonly in his dismissal of what is actually a pretty good film, he was correct on several counts. Firstly, the film is undeniably ‘swinging’- it captures London on the very cusp of the 1970s in all its hedonistic camp (‘no holds barred in SW3’ as one character puts it). Secondly, the film is unquestionably ‘immaculate’ (taking ‘immaculate’ to mean pristine, beautiful, sleek). This is not entirely surprising, as the stylish cinematography belongs to Geoffrey Unsworth- veteran of seven decades of film whose c.v. includes such visual treats as Scott of the Antarctic(1948), Becket(1964), 2001, A Space Odyssey (1968), and the first two original Superman films starring Christopher Reeve. Coupled to this experience is director Alan Gibson, whose work helped outline television drama in the 1960s, 1970s and 1980s (the best known perhaps being the two Dominick Hyde plays in the early 1980s). Thirdly, a point not mentioned by Halliwell, is the highly interesting cast, which ranges from the nymph-like Judy Geeson and the striking Martin Potter to the stately Michael Redgrave and character actors like Peter Jeffrey and Brian Wilde. So, we have a film with an experienced drama director, a fine (if slightly unorthodox) cast, and a fine cinematographer. It is then a case of what they do with the plot. It would be cruel- malicious even- to outline the intricacies of the plot of Goodbye Gemini. Suffice to say Julian (Martin Potter) and Jacki (Sally Geeson) are brother and sister who arrive in London, strangers to the big city. There they soon meet Clive Landseer (Alexis Kanner), someone who takes an interest in both of them. During heady parties (frequented by faceless ‘swingers’ as well as more defined characters like the uber-camp Nigel Garfield (Terry Scully) and James Harrington-Smith (Michael Redgrave), the trio are joined by Denise Pryce-Fletcher (Marion Diamond) and a tete-a-tete (twice over) ensues. However, things are not as they seem- even Agamemnon (Jacki’s dark teddy bear) seems to be hiding a secret. To compliment what is an unusual and at times very gripping slice of swinging British cinema (criminally unavailable on any format prior to this release), this Odeon Entertainment special edition features a host of excellent extras. These include a terrific audio commentary with Judy Geeson and Producer Peter Snell, a featurette, trailer and stills gallery. Goodbye Gemini is well worth both time and money, and, for me, the late Leslie Halliwell used the right evidence to come to the wrong verdict. 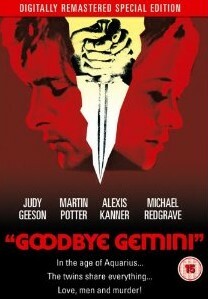 Goodbye Gemini is available in May 2010 from Odeon Entertainment.